Together, Iznogoud and Quatsing drag/carry Slingbill back to the village and seek out the priest (Brucian). The priest agrees to help with healing Slingbill, and invite the PCs into his humble home. Iznogoud is still charmed by the charming Swamp Maiden, and wants to take the priest’s liver back to the woman of his dreams, as she asked of him. While the Priest is working with poor Slingbill’s wounds, our charmed hero sneaks up and attacks the priest from behind, nearly severing his head with a powerful swing of his sword. The Priest slumps forward on the bed. Iznogoud is preparing to cut out the still living Priest’s liver, when he suddenly freezes and falls to the floor, writhing in agony. (The Priest’s Three-Eyed Raven fetch makes a spirit attack and defeats Iznogoud). Quatsing and the now healed Slingbill tie up Iznogoud and give the priest a healing potion, which saves the poor man’s life. After a strange soundless fall, our heroes arrive in a white featureless place. They walk around in the fog-like white for days or hours, and finally arrive at the outskirts of a dense forest. The forest is composed of lots of twisted brush and trees, with the muddy ground adorned with weird mushrooms and foul berries. No animals are heard or seen, and there is a looming sense of doom over the place. After some stumbling around in the vegetation, Ernie and Sigurd are found at a small campsite. They say that only a short time have passed since they last met. A bit behind and having arrived at a different spot than the others, Iznogoud stalks the rest of the group, staying hidden, with delirious ideas of how to get vengeance on his former buddies (yes, he’s clearly gone out of his mind). After having talked to Constable Gremin, you went to pay a visit to the village Priest – Shaman Brucian. Dawn was beginning and the extent of the damage and violence from the passing night became evident in a much visceral way. Dead and undead bodies everywhere, where they had fallen in battle. No one answered at the priest’s house, so you invited yourselves and searched the house, but no evidence of foul play was uncovered. Next, you went to the church nearby. A lot of villagers was laying out rows of bodies in various states of decay in front of the church. You found the priest inside, working to help his flock. Jean and Luc had come in the middle of the night with the horribly mangled and dead Marcel on a cart. Brucian had attempted a Raise Dead spell from his scroll, but it had not worked. After the failed resurrection attempt, Luc and Jean had stormed away from the church. This was the last time he had seen Jean or Marcel, although a letter from Jean had told him about Luc being sent away to the stilt house in the swamp (by Jean). Meanwhile, Slingbill and Quatsing have gone to the Full Moon Inn, where they discover that young Luc seems to have awakened from his insanity as from a bad dream. After having talked to Shaman Brucian, everyone gathered at the Inn where Luc recounted the story of Marcel’s obsession with the Scroll of Hyskosa and his frantic search for the fabled document. He also told them of the fateful night when he and Marcel found the scroll and how they got attacked by the ancient undead in the Old Cemetery, and how they were saved in the last moment by Jean. 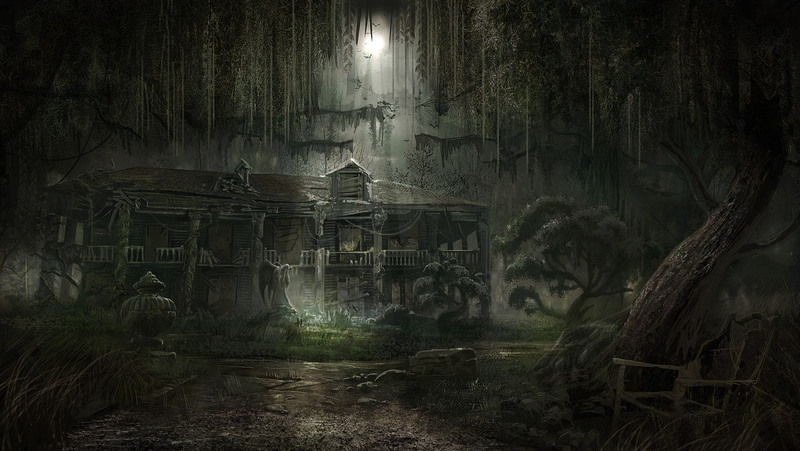 The PCs and Luc went to the d’Tarascon Townhouse to search for the scroll, which was found hidden behind a bookcase on the second story of the eerily silent and empty house. They also found a black cloak with red liquorice in the pockets. The meaning of the cryptic text on the scroll was however impossible to figure out. Well armed, and ready for battle, our heroes enter the abandoned mansion through the front doors. Finding nothing they proceeded to the left (south) finding…nothing. Then, after searching the large ballroom with the stairs (where they fought last time) they were suddenly attacked by ten snarling things coming out of several doors and attacking from all directions! The battle was furious with lots of wounds dealt to the heroes, but at last all the abominations lay dead and mangled on the floor. 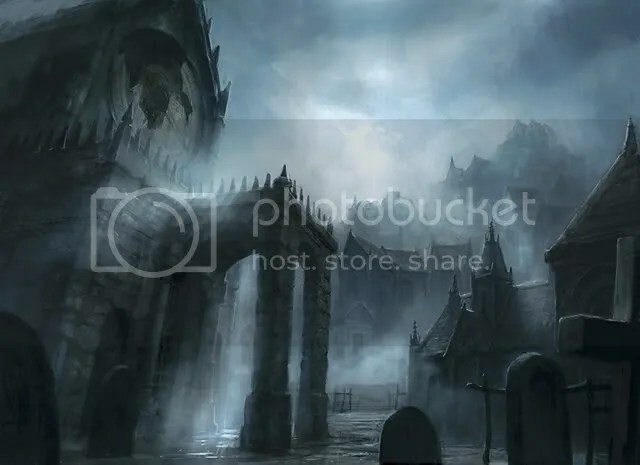 The session started in media res with Iznogoud and Slingbill in the graveyard in the middle of the night, battling a howling storm… Last session they had heard strange noises from one of the tombs, and sneaking closer, they noticed that the mausoleum doors were ajar. Our heroes quickly decided to withdraw and return with more troops. 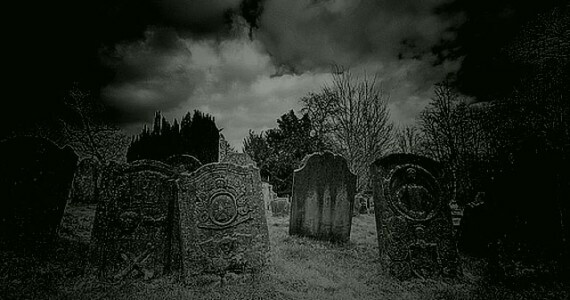 After going back to the Full Moon Inn to fetch the rest of the crew they returned to the graveyard and entered the same way as last time. Quatsing and Iznogoud was entrusted to stay by the cemetery wall and keep watch. Subsequently, they tried to break into the d’Tarascon family mausoleum, but failed horribly due to the lack of lock picks. The group decided to split up: MacFly was to try to track the putrid trail outside the wall; Slingbill and Sigurd was to investigate the caretaker’s office by the cemetery gates. With a loud crash, Sigurd kicked in the door and they searched the place looking for the keys to the Old Cemetery and the funeral ledgers. They found the wanted items as well as keys to all the padlocks and on top of that, Sigurd stole old Pierot’s 12 silver ducats without hesitation. Suddenly, loud voices was heard outside the gates – someone had heard the crash from the kicked-in door, and now they were coming to investigate. Sigurd and Slingbill retreated the same way they had entered. Meanwhile outside the wall, Ernie managed to pick up the track of the stinking creature and managed to follow the track to the eastern side of the graveyard before losing it again. Trying to pick up the trail again, he instead found a small triangular opening in the cemetery hill, surrounded by two stone slabs and hidden behind some vegetation. The group decided to immediately investigate the opening, which turned out to be a 100-120 foot long low tunnel dug in the moist earth, leading into the Old Cemetery. (Quatsing and Iznogoud was still on the outside keeping watch). They also found a strange six-star pattern engraved in one of the stones at the tunnel opening. The PCs exited the tunnel from under the base of a broken statue of an angel holding a spear. In front of them: a huge mausoleum. To the right: more tombs. Lots of them. All hidden in dense vegetation and the ground covered in century old leaves and rotting debris. As they approached the smaller tomb to the right, there was a luminous flash, followed by ear-deafening thunder. And the rain began to fall. Like a monsoon. The flash also revealed a six-star pattern on the slightly ajar doors of the nearest tomb. Sigurd listened at the door, and hearing nothing he entered the dusty tomb with a lantern in his hand, trying to find any clues. Suddenly, he realised that he wasn’t alone! In the corner, a tall zombie-like thing armed with two axes, was staring at him with its red glowing eyes… Sigurd dropped the lantern and ran outside again, where the the PCs drew their arms and braced themselves for the upcoming battle. The thing swung at them with its axes, but being faster and better armed, the PCs quickly managed to damage the thing badly with sword and spear and finally a mighty blow from Sigurd’s greatsword clove the abomination. As they stood there, regaining breath, a sigh was heard from the right and another undead thing came shuffling towards them through the debris. Slingbill attacked, cleaving its ugly head in a few swooping cuts. The PCs investigated the tomb, finding a coffin marked with the six-star sign. It was also evident that someone had been here disturbing the coffin recently. In the coffin they found an empty ivory scroll case, but no corpse. Then the PCs heard a commotion to the northwest, and observed a large mob of moaning and shuffling things making their way towards the cemetery gates (to the new cemetery), taking no interest in our heroes. Realising that the undead horde was probably on their way to the village, Ernie ran to the wall to tell Quatsing and Iznogoud what was happening, urging them to warn the villagers of the imminent danger. At the same time, Slingbill and Sigurd investigated the larger building. They saw a sickly yellow light escaping the inside from small-paned windows high above and carved stone steps leading to a pair of large stone doors. Sigurd pushed the doors open and was greeted with a horrendous sight: a large hall, floor covered by broken bones and rotting carrion. In the center, a raised platform made of bones and on the platform a throne made of more bones, all illuminated by the moon through a huge glass dome in the roof. Two braziers made from human skulls flanked the platform. And sitting on the throne: a most hideous zombie-thing in an expensive but tattered red robe. And most offensive of all: the stench of decay, death and week-old rot. Our heroes tried to resist the stench, but couldn’t, which resulted in Slingbill losing physical strength (-1 to CON) and Sigurd feeling weary and distanced (-2 to CHA). Despite the reflex to run away, the brave warriors stepped into the room, weapons drawn, only to realise that the Marcel thing had company. Lots of them – six zombies and two of the greyish red-eyed zombies armed with longbows. The thing spoke, claiming to be Marcel d’Tarascon, Lord of the Undead and followed by demanding that they return a certain “scroll of the six signs”. At the same time the six undead attacked the PCs. Our heroes fell back just outside the doors to create a choke point and bravely fought the monsters, killing two of them. Then they drew to the side and the Undead Lord himself decided to step in and finish our heroes. Some lucky rolls and wise use of combat manoeuvres repelled its attack and forced it to retreat, but it was too late. A combination of sword chops decapitated the Lord of the Undead! The undead thralls hesitated but resumed their attack. At this point, a tremendous flash struck down from the skies and shattered the glass dome of the tomb. At the same time, the moon above was seemingly swallowed by a giant maw and turned all red! The undead lost all initiative and just stood dumb-founded, looking at the moon, giving the PCs the opportunity to cut them down without resistance. Meanwhile, after warning their friends, Ernie was to return to the others when he heard a sound behind him. A crazed man looking a bit like Luc, dressed in a black cloak and brandishing a large curved dagger came at him, slashing in the moist air. Ernie cast a spell and teleported out of danger, up on the cemetery wall. The crazy man turned around and ran towards the others. MacFly tried another spell, but failed and the man reached the others outside the big mausoleum. He assailed Slingbill, causing a deep cut in his arm. Sling bill missed his riposte but Sigurd struck the madman with the flat side of his sword, beating him unconscious. After a brief search of the old cemetery and the fallen foes, our heroes returned to the village. There were much death and destruction, but the villagers had managed to stave off the attacks, much thanks to the warning provided by Quatsing and Iznogoud. Constable Gremin also told them that the undead had stopped fighting when the moon turned red and that the villagers had been able to cut them down while they were in a trance-like state. 1. What is this scroll Marcel was talking about? 2. What is going on on the d’Tarascon plantation? 3. What happened to the brothers that night a month ago? 4. What was happening with the moon? 5. What about the shady priest with the 3-eyed raven? Meanwhile outside, Sigurd followed the vile stench around the building and found a trail of footsteps, lined with black ichor and bits of putrid flesh. When things had calmed down, it was decided that Ernie, Quatsing and Sigurd should stay at the inn, taking care of the innkeeper and his family, while Iznogoud and Slingbill should follow the disgusting track to wherever it would lead them. The tracks seemed to originate outside the village, in the swamp maybe, and seemed to lead towards the cemetery. While following the tracks, a loud female shriek of terror was heard. The PCs ran in the direction they thought was right. Then, a second scream echoed through the night – in the opposite direction! Iznogoud and Slingbill ran towards the new sound and made a grisly find: the daughter of the innkeeper – Lillin Bascombe – lying face down in a pool of her own blood, and around her, a ring of five pieces of red liquorice! The girl was dead, having suffered multiple terrible knife wounds. Soon, constable Gremin and his two deputies arrived, and together the PCs and the lawmen ran into the narrow streets to find the killer. These efforts turned out to be fruitless, as the killer was long gone. The constable told Iznogoud that this was the 6th murder in the same style, complete with red liquorice, and that they had started to occur before the PCs arrived, so they were not suspects. He also told them that the red liquorice was sold at the Bakery. Our heroes decided to go back home and regroup. The next morning they went to the Bakery and talked to Louise D’Cann who told them that her biggest customers were: Mordu (the village weirdo), Jean Tarascon (the missing brother of Luc and Marcel) and the Bordell children (kids of the local carpenter). Iznogoud and Slingbill went to talk to them all. Mordu was indeed a weirdo, a hobby conspirationist with his own theories on what has befallen the village: basically all the problems are due to an evil cult intent on awakening the Old Swamp God. Mordu also volunteered to help with the investigations. Jean Tarascon was of course nowhere to be found. The Bordell children (there’s eight or nine of them) were quite innocuous, but their father, Marcus, could tell that old Hogarth was the first to die out on the plantation fields, and that he immediately rose up as an undead abomination. This happened about three weeks ago. Marcus suggest that they speak to old Pierrot the cemetery caretaker, or the village priest Brucian. Later that night, the PCs brought some gear and went to the cemetery to get the papers. They used rope and grapple to negotiate the 10-foot wall and snuck into the new cemetery near the wall to the old parts. From the wall they could see that the old cemetery was totally overgrown with thick and twisted vines, hiding the mausolea and tombs in a massive growth. As they approached the caretaker’s office they heard some sounds coming from another part of the cemetery and went sneaking to inspect. A smaller mausoleum was open and sounds was heard from within. The evening was spent discussing the events of the day and carousing at the village inn. In the morning of the 2nd day in the village you went to the blacksmith and the general store to purchase weapons and other adventuring gear. Iznogoud the Dashing Rogue used his meagre funds to take a bath and a proper shave and then went to the tailor to get a foppish outfit of clothes. From the blacksmith’s wife you learned that her son had been missing for five days, after never having returned from his work at the d’Tarascon plantation, south of the village. You decided to immediately head for the plantation to see what was going on. After walking through abandoned sugar cane fields you finally arrived at a eerie, silent mansion with heavy dark blinds covering all windows. No life was to be seen anywhere. Iznogoud and Slingbill went around the house to scout. Ernie, Quatsing and Sigurd climbed a low roof and smashed a window on the second floor to enter the dark house. All you found was a lot of richly furnished rooms with no signs of life anywhere. Two missed sanity checks. Two massive sanity losses. Two temporarily insane characters. With some crossbow and machete work you finally managed to defeat the monstrous maid, fear heavy in the thick air. That’s when sounds of lots of shuffling feet and howling noises started to emerge everywhere. A hasty retreat was made, dark shuffling figures dashing after you as you made it to the outside. You went back to speak to the Constable, but only managed to aggravate him when disturbing his investigation of a murder scene (one of the maids from the Inn had been murdered the previous night), and nearly got thrown in jail on account of being “foreign troublemakers”. You also learned that the d’Tarascon family have a townhouse in the village and that the suspected murderer left a clue at the murder scene – a piece of red licorice. Coming around a bend in the waterway, you heard a loud buzzing noise and before you, a big brute of a Caliban burst out of the bushes beside the water and threw himself diving into the water, followed by a swarm of inch-long, nasty-looking mosquitoes. 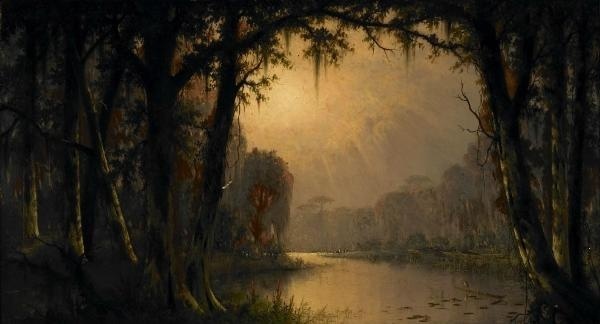 The insects remained in the area for a while, but then left off after having assailed the people in the swamp boat. The Caliban happened to be Iznogoud, another member of the ships crew. In the evening, after traveling all day (at one time followed by a Swamp Dragon), you started looking for a site to set camp, when you spotted a single light ahead. It turned out to be a small island with a decrepit hut. You stopped and investigated the place, finding traces of habitation. Suddenly a boat came to shore, bearing a beautiful young woman who claimed to have been out tending her nets. Everyone was jumpy and suspicious except Iznogoud, who seemed to be quite enamored by the young woman. Ernie the Elf kept trying to use his Second Sight too see if something was wrong and most of the gang kept away from her. Iznogoud however, ended up being intimate with the woman, after which she asked him to bring her the liver of the priest in the village. “The lost one has called you! The dead will walk with the coming storm, and you must find a way to put them to rest. If you cannot, the rain will turn to blood! It will drown you and all of Marais d’Tarascon”. After this, the Vistani retires to their wagon, while you sleep beside the fire. The next morning, the wagon is gone. The sentry has no recollection of what happened, though. In the afternoon of the next day (day 4 since the shipwreck) you come upon a house built on four high poles. It is very well lit. Suddenly, a rope ladder falls down and you climb up to find a silent young boy sitting in a circle of lit lanterns in the house’s only room. In his hands is a children’s book with short poems, dedicated “To Luc, my beloved brother. Marcel”. The boy does not move, nor does he speak. When you leave, he follows like a silent dog. As you leave the swamp, the building storm is increasing, black clouds rolling in and distant thunder and the occasional flash light up the sky. Still no rain, though. After a few hours more, you reach a village at the edge of the swamp: Marais d’Tarascon. Soon, you find the “Full Moon Inn” where you take up residence. Most of you decide to stay there and enjoy the comforts of civilisattion, talking to the innkeeper, Jerald Bascolm, his wife Henrietta and their daughter Lillin, who manages the barmaids. Soon however, most people leave, to attend a funeral. Ernie the Elf can’t sit still and decides to investigate the rather large cemetery that you saw upon arriving. There, he meets the caretaker, a certain Pierot and finds out that there are two parts of the cemetery – the new that is used and the old that is walled in and has been unused for more than a hundred years. Meanwhile, Ernie the Elf have ventured out to see the funeral. The entire village have gathered and the village priest is making a funeral speech over a coffin bound in heavy chains. You can hear muffled thumps from within the coffin, but no one takes note. The coffin is loaded on a cart and a slow procession moves up the cemetery hill toward the cemetery gates. The sounds grow louder and the coffin starts to move. People flinch, but soon regain their composure. The coffin is brought to an open mausoleum and quickly carried in, after which the mausoleum is locked by Pierot and then everybody returns home.